The Applied Biosystems ViiA 7 Real-Time PCR System gives you robust qpcr features in a system that’s sleek and contained on your benchtop. With interchangeable blocks, and TaqMan Micro Fluidic Cards compatibility this adaptable PCR system can help streamline your lab’s productivity and grow with your needs. This qPCR uses an Optiflex system for enhanced fluorescence detection, as well as high resolution detection for use with TaqMan Array Micro Fluidic Cards, 384 well plates and 96 well plates, as well as six decoupled excitation and emission filter channels to fully support multiplexing capabilities. This real time PCR can also be configured for 21 CFR Part 11 compliance and HRM capabilities and features intuitive software and flexible data collecting. The ViiA 7 PCR system comes with multiple ramp methods, and convenient walk away capabilities freeing users up for other tasks during a run. The Applied Biosystems ViiA 7 Real-Time PCR System has a user-friendly touchscreen interface, one button protocols and tool free block exchange for faster turnaround times. 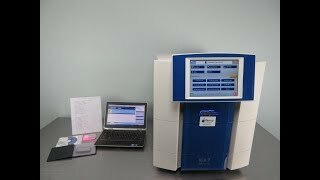 This qPCR system is a great choice for medium to high throughput needs particularly when paired with a robot such as the Applied Biosystems Twister II (sold separately) For precise quantification, technicians can choose a more targeted singleplex reaction for detection of changes as small as 1.5-fold. The powerful integrated software lets users decide their method of choice, helps to enhance data analysis, as well as recover data from over 100 runs. This Applied Biosystems ViiA 7 Real-Time PCR System has been fully inspected and comes with current validation reports. All of our lab equipment comes backed with our standard warranty. Should you have any questions, please don't hesitate to contact us, we're here to help.